These handy HDMI keystone inserts allow you to add an HDMI connection to any standard keystone wall plate. 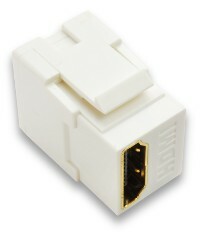 They feature an HDMI Female connector on each end, thus forming a Female-Female coupler. This makes in-wall wiring quick and simple. Installation is easy and requires no special tools.